Garden incinerators & Fire Pits are delighted to present the excellent Castmaster Heavy Weight Basketweave Cast Iron Chiminea- Bronze Finish. With so many on offer right now, it is good to have a brand you can recognise. The Castmaster Heavy Weight Basketweave Cast Iron Chiminea- Bronze Finish is certainly that and will be a superb acquisition. For this reduced price, the Castmaster Heavy Weight Basketweave Cast Iron Chiminea- Bronze Finish is widely recommended and is always a regular choice with many people. Castmaster have provided some great touches and this equals good value for money. 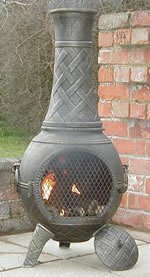 Our Medium Basketweave 2 in 1 cast iron BBQ chimineas are one of our most popular models. Featuring a basket weave pattern around the chimney and base of the bowl. They stand at 102cms tall and have an 43cm Maximum diameter. Extremely robust, this comes complete with matching rain cap, fire grates, carrying handles, hinged fire guard door and bbq grill. Simply lift off the chimney to use for open top cooking. Having a solid one piece bowl and one piece cast chimney, weighs over 45kg. Finished in heat resistant bronze paint. Minimal assembly required. 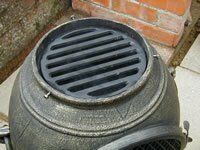 The fire grate is made of two removable sections allowing for ease of de-ashing via the hole in the bottom, simply lift off its covering plate to empty. Featuring 20cms diameter cooking grill for open top cooking.